Yarn Type SALE 34% OFF! Soft twist and beautifully soft colour changing shades. This thick and thin yarn is sure to inspire some perfect winter knits. 90% Acrylic, 10% Wool. Wool Cycle, May be dry cleaned, Do not iron, Reshape whilst wet, Do not tumble dry, Dry flat. Leaflet with designs for a Wavy Throw and Dropped Stitch Throw using Sirdar Sylvan Chunky. Leaflet with designs for a Mens Sweater using Sirdar Sylvan Chunky. Leaflet with designs for a Mens Cardigan using Sirdar Sylvan Chunky. 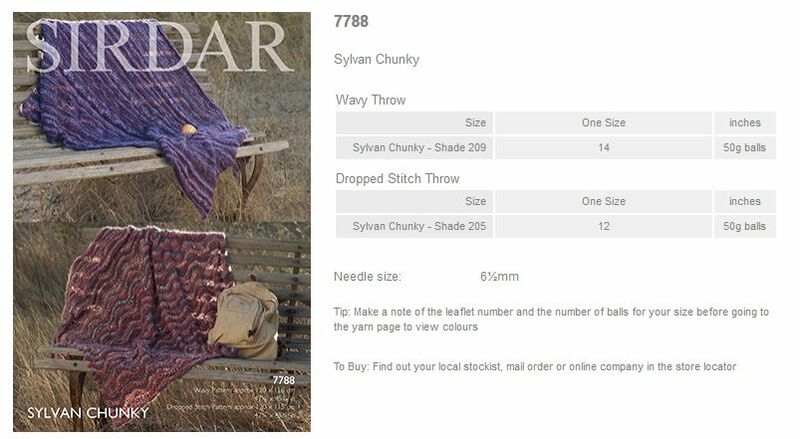 Leaflet with designs for Men and Womens Scarf and Hat using Sirdar Sylvan Chunky. Leaflet with designs for Womens Long Cardigan using Sirdar Sylvan Chunky. Leaflet with designs for Womens Cardigan using Sirdar Sylvan Chunky. Leaflet with designs for Womens Sweater using Sirdar Sylvan Chunky.